Witch make up in under 10 minutes - Cherry Colors - Cosmetics Heaven! A friend of mine asked me to do a simple and very quick tutorial for busy moms. I know she probably meant a tutorial in under 5 minutes and natural looking, but for beginning this is a Halloween night out make up. For all those who won't put a costume on, but still want to have something on your face. P.S. You can always add a web or a spider or anything like that (tutorial coming soon!). 2. 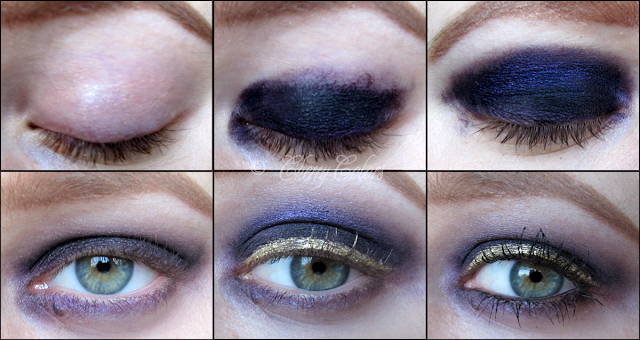 Apply dark eyeshadow (I used dark purple) all over the lid. You don't have to be exactly precise. 4. Blend, blend and again BLEND! 5. Apply gold eyeliner. Now you should look like a gypsy! Enjoy your witch make up ;)!